Home » Analysis & Opinion » Ashtone Morgan Turns 100: Happy 100 Toronto FC Appearances Ashtone! Ashtone Morgan Turns 100: Happy 100 Toronto FC Appearances Ashtone! This is what you get for 100 appearances. It’s fitting in a way, that Ashtone Morgan is the first Toronto FC player to get 100 appearances with the club. Sure there are arguments to be made for others that have served – Stefan Frei, Doneil Henry and Dwayne De Rosario are the ones that gets mentioned the most often – but myself and many others have always had a soft spot for Ashtone ‘Nasty Left Back’ Morgan. A home grown player with noticeable talent if you saw him in the academy and a great attitude. When he first started playing for the first team he was one of the players I always kept my eye on; not just because I tend to watch the defenders but because for one so young he played with a lot of confidence and had so much speed and energy; it was hard not to watch him. We were also getting to watch a player (a U20 player of the year) that could very well be a fixture with the national team grow and develop; who doesn’t want to be there from the beginning? We’ve been lucky in a sense to get to watch a very few players from the beginnings of their career; and we’re lucky that we get to see him reach 100. On the occasions that he played, he was more woeful than anything – it was hard to watch as both a fan of TFC and a fan of the player; to see him make foolish mistakes and not have the attacking or field sense he once did. 2014 saw him completely nailed to the bench – only playing in Voyageurs Cup games – which almost felt like punishment as he sat there game in, game out, rarely getting the call. Of course having Justin Morrow in your squad will do that, but it seemed to be more than that; rarely given a chance to play even when a sub was needed. He played a couple of games in the dregs of the season in the fall when everything was going to pieces and many of us thought that those would be the last minutes that we’d see him play in TFC red. It was a tough year for him from a national team perspective as well; having featured in a number of games in 2013 he wouldn’t put on the maple leaf at all in 2014. Surprisingly he was not cut loose in the off season – was he going out on loan, going to play with TFC II or were they waiting to get another piece? No, when all the dust settled he was still a member of the first team and seemed to not be going anywhere – but there was still that pesky thing about getting playing time, with the back four seemingly set and Morgan again on the outs. But then injuries cut a wide swath through the Toronto FC backline to start this season and instead of ignoring a useful option, Vanney put him in the lineup and hey suddenly he’s not doing so bad. Has he made mistakes? Of course he has. Does he look bad? No, not at all. He’s not back to the same player that used to go marauding up the left wing, whipping in crosses for Danny Koevermans and the like, but he’s looked a damn sight closer than he has in the past two years. If he can regain that form and that confidence then there is a future for Morgan in MLS. And through all of the ups and downs he’s still on the radar of the national team having already played this year and hopefully still in Benito Floro’s plans for the future. 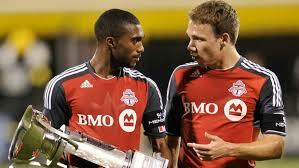 In the end I am happy that it is Ashtone Morgan that gets to be the first Toronto FC player to reach 100 appearances. This has been his only club, his home, his fans to play in front of for eight years. What could be more fitting than to see one of the young men we’ve watched grow up on the pitch get that honour. Welcome to the century mark Ashtone; I raise my glass to you and here’s to another 100!